As you guys know by now, we unveiled a new look towards the end of last year. As part of our new branding efforts, we wanted to ensure our job site trailers were looking clean and fresh. We got with some real experts on the matter, Lowen Color Graphics, to get these trailers up to par. They were able to do a graphic “wrap” on the semi, which is a printed material with an adhesive backing that sticks to the sides of the trailer. We’re pretty pleased with the result. Check out a few photos from the album on our Facebook page! Because we’re excited about how cool our trailers look, we want you guys to get in on the fun! We want to see who can spot the trailers first! Right now, we have two trailers on two separate job sites in Kansas. One is fairly easy to spot, while the other one is a little more difficult. The first person to find the easy one gets an awesome Hutton t-shirt. The first person to find the harder-to-spot trailer gets a sweet Hutton Construction prize pack! 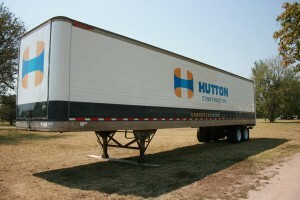 To win, all you have to do is snap a picture of the semi and send it to Brett Weller (Hutton’s marketing guy) at bweller@huttonconstruction.com. We’ll post the winning shots, and the names of the winners on our Facebook page. Hutton Construction employees and their families are not eligible. Each trailer is visible from public places, so please don’t go onto private property. Also, DO NOT try to submit your picture to any workers on-site! You’re not wearing a hard hat anyway. Have fun and good luck!